Stephen Daly was born near Ferbane in Co. Offaly in 1574. Like many young men of the time, he left the area for the continent, and there he joined the Capuchin Franciscan Order. He was ordained to the priesthood and ministered in what is now Belgium. Francis Nugent campaigned persistently for permission to set up a Capuchin presence in Ireland, and finally this as granted. Stephen became the first Irish Capuchin to set foot in his native land in 1615, to be followed shortly thereafter by a few others. At first he and his companions were based in Dublin, but later he made his way to Offaly to his home parish in the diocese of Ardagh and Clonmacnoise. illusory. (The "gunpowder plot" of 1605 when an attempt was made to blow up the houses of parliament in Westminster did not help.) Penal laws were beginning to come into force. From 1607, Catholics were barred from holding public office or serving in the army. As in England and Scotland, Catholics had to pay 'recusant fines' for non-attendance at Anglican services. And while it was still possible to celebrate Mass in private, public celebrations were forbidden. In 1611 Bishop Conor Devany of Raphoe, almost 80 years old, was arrested while administering Confirmation and in February of the following year was hanged, drawn and quartered in Dublin. With him died Patrick O'Loughran, a priest from Cork. This was the setting in which Stephen and his confrères ministered. On the continent, the friars were used to living in community and working openly among the people, highly visible in their Capuchin habits and long beards. 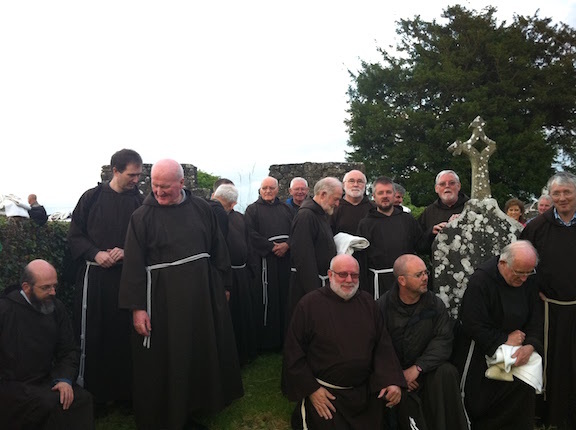 In Ireland, however, the friars had to dress in secular clothes and community life was not possible. Stephen ministered in Ireland for only five years, dying at the age of 45 in 1619. 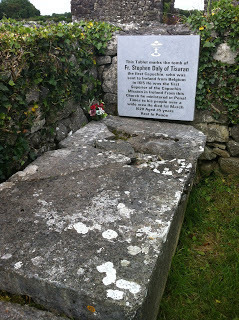 He is buried in a small rural cemetery in Tisaran, Co. Offaly. In 2015, a commemorative service was held at his graveside, attended by a large number of friars.